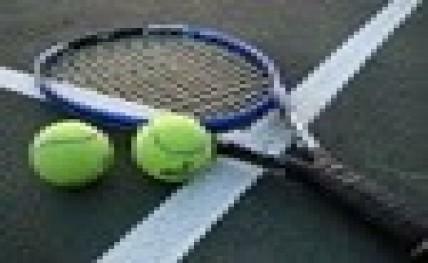 Bangalore, Dec 10 (IANS) Wild card Adil Kalyanpur of Karnataka pulled off the first upset of the tournament when he beat seventh seed Mayukh Rawat 6-2, 6-1 and entered the last 16 round of the RT Naayan memorial Cup AITA National Series Under-16 junior tennis tournament here Tuesday. Kalyanpur, playing an attacking game, never allowed his rival to settle down and coasted to the round of 16 where he was joined by top seed BR Nikshep of Karnataka who ousted the big serving B Anirudh 6-2, 6-3. Second seed Sanil Jagitiani of West Bengal defeated local lad Rahul Shankar 6-3, 6-1 while third seed Parikshit Somani of Assam and fourth seed Yash Yadav of MP also advanced to the pre-quarter-finals. In the girls section, top seed Snehal Mane of Maharashtra disposed of Shivani Manjanna of Karnataka 6-3, 6-3 and made the last 16 round. Boys singles (second round): Siddarth P bt Siddarth Gowda 3-6, 5-1, 6-4; BR Nikshep bt B Anirudh 6-2, 6-3; Adil Kalyanpur bt Mayukh Rawat 6-2, 6-1; Uttkarsh B bt Chaitanya 6-3, 4-6, 6-1; Yash Yadav bt S.Manish 6-2, 6-3; Vignesh S. bt R.S. Mohit 6-2, 3-6, 6-4; Ishaq Eqbal bt Guhan Rajan 6-3, 6-1; Dhruv Sunish bt Abhinav S. 6-3, 4-6, 6-1; Parikshith Somani bt Adhithya Muthu Selvan 6-4, 6-2; Rian DP bt Hari Singh 6-1, 6-0 ; Siddarth B bt Vikram Dhananjay 6-3, 6-3; Rishi Reddy bt Manaz 7-6(1), 6-1; PC Anirudh bt Rohan Reddy 7-6(1), 6-0; M Taqqudin bt R Srivatsa 4-6, 6-1, 6-1; Sumitpal Singh bt Sai Pranav 6-2, 6-0; Sanil Jagitani bt Rahul Shankar 6-3, 6-1. Girls singles (second round): Snehal Mane bt Shivani Manjanna 6-3, 6-3; Lathika Prem Kumar bt Muskaan Ranjan 6-2, 6-7(4), 6-2 ; S Soha bt Priyanka M 6-0, 6-1; CS Praneetha bt Pareen S 6-4, 2-6, 6-3; Vaidehi C bt Shaikh Tahoora 6-0, 6-0; Sai Avanthika bt Yubrani Banerjee 6-2, 5-7, 6-1.